Rochester, NY is getting five electric buses. This “puts Rochester in the lead on electric buses in New York” (see below). This will help curb greenhouse gas emissions especially when our grid goes green. There are many advantages to increasing bicycling and electric buses in Rochester. 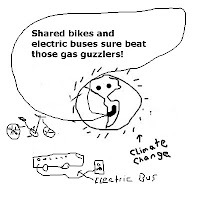 Active transportation (walking and bicycling) improvements will make us healthier, and electric buses are quieter and emit none of those smelly fumes we often associate with public transportation. But, it is also important to frame these advances in local transportation in the context of Climate Change. My experience (former chair of Rochester Sierra Club’s transportation committee) is that those advocating active transportation and better public transportation tend to downplay the role of Climate Change, when it should be the overarching priority. In previous years, many people were concerned that discussing Climate Change when encouraging the public to walk, bike, and use public transportation for short distances would decrease the likelihood that the public would show up to our demonstration rides or programs. I guess active transit promoters believe that mentioning Climate Change in any context is a turnoff. Advocates would rather highlight all the other advantages of these green transportation options (they’re fun, they’re inexpensive, they’re healthy, they’re what younger and older generations want now, and they’re a great way to socialize), than raise the specter of Climate Change. Instead, advocates seem compelled to raise the public’s enthusiasm for the really exciting possibilities of our new transportation options, including electric cars, high-speed rail, trollies, bus rapid transit, and those beer-drinking-peddling-tavern whatchamacallits roaming around our city. Messaging better transportation options by ignoring the elephant in the room is the wrong strategy. One of the consequences of this approach is landing a climate denier in the oval office. Communicators failed to bake in a warming world when talking about our future with the public. Too many people are still trying to frame Climate Change so it won’t appear dire or inconvenient. The message seems to be that addressing Climate Change will just be a hopeful time of transition along the way to prosperity. But we won’t prosper, or survive for that matter, if we don’t prioritize addressing Climate Change on a scale and timeframe that will matter. Part of the problem in communicating Climate Change is correctly characterizing what it is. It isn’t just a new warming trend that we’ve created where some folks will get warmer. It is a situation where we have amplified all our past environmental problems—pollution, overconsumption, ecosystems degradation, loss of biodiversity—and accelerated the pace of catastrophic collapse. We will not overcome this crisis with business as usual but just a little better and efficient than before. Every aspect of Climate Change must be communicated to the public—including the awful stuff. Not to frighten, but to warn against inaction during a time when the window of opportunity is closing. We should be understanding our future transportation needs through the lens of Climate Change. 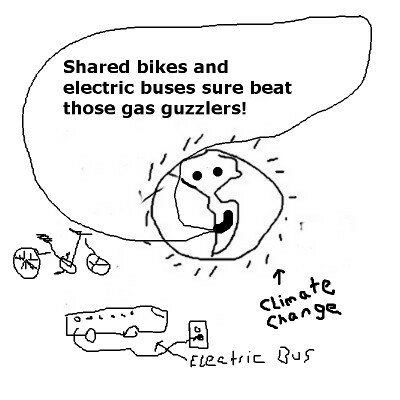 Not just quietly mentioning that, oh, by the way, another plus of our new transportation options will be to reduce greenhouse gases, secretly hoping the public becomes informed about the importance of updating our transportation infrastructures that help us address Climate Change. Our transportation choices must be orchestrated within our collective need to address Climate Change; the way we move about both causes warming and provides a real solution for this crisis. The City’s Climate Action Plan, and many other communities’ plans, (including the federal government before Trump), communicated this effectively without pandering to the public’s will not to believe. At some point along this continuum of man-made warming, there will be a much sharper focus on transportation because we will be scrambling for ways to cut our losses. Getting us out of our gas-guzzlers and the fossil-fuel based infrastructures they depend on, could go far in quickly making our way of life sustainable. What must become abundantly clear at this point in time is that we aren’t going to address Climate Change without public support. We can no longer put climate deniers into office. We cannot simply push a marketplace mentality, which got us in this mess in the first place. We cannot talk about Climate Change without making people uncomfortable—any more than we could stop slavery back in the day without people getting upset. We are either going to change our behavior soon or we are going to further threaten our own survival as a consequence of an ideological stance towards our life support system. Hope must be based on reason and reason demands that we include a full discussion about Climate Change when addressing our future.